Turkish-Russian relations took a downward turn in the aftermath of Turkey shooting down a Russian Su-24 jet in November last year. Moscow has, however, given a positive response to Ankara's recent attempts to break the ice, welcoming President Recep Tayyip Erdoğan's letter to Russian President Vladimir Putin on the occasion of Russia Day and Russia's Ambassador to Ankara Andrey Karlov's attending an iftar (fast-breaking meal) hosted at the Presidential Palace yesterday. 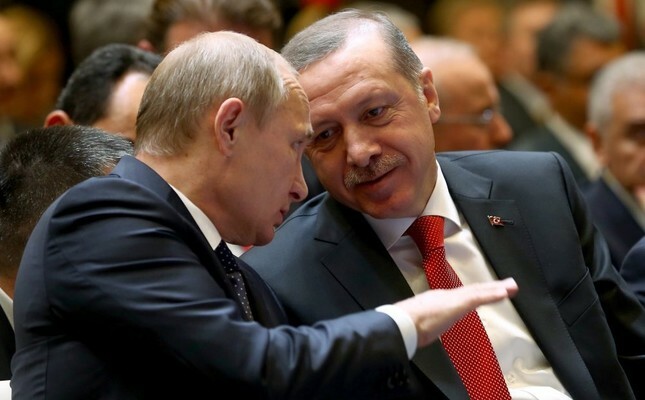 The Kremlin said on Wednesday that Russia wants to restore good relations with Turkey. Moscow warned, however, that Ankara must apologize for downing the Russian jet. "We would like and we want a normalization of our relations and their return to the period of good and mutually advantageous cooperation," Kremlin spokesman Dmitry Peskov said on a conference call with reporters. "But at the same time, President Putin has made it crystal clear that after what happened any normalization of ties does not look possible before Ankara has taken the necessary steps," he said, referring to Russia's insistence that Turkey apologize and pay compensation for shooting down the Russian Su-24 attack plane, shot down by Turkish fighter jets in November while flying in Turkish airspace while carrying out operations in northern Syria in support of the BasharAssad regime. Hours after the statement, presidential sources said that Karlov was scheduled to attend the iftar at the Presidential Palace for foreign ambassadors and members of the Foreign Economic Relations Board (DEİK). Commenting on recent attempts to repair relations, the director of the Institute for Strategic Thinking (SDE), Professor Dr. Birol Akgün, said these attempts aim to prepare both the people of countries for a a joint diplomatic text and stressed the importance of the bilateral will for possible reconciliation. "With Prime Minister [Binali] Yıldırım's government, Turkey has shown that it aims to decrease its foes and increase its allies. For Russia, this situation is unsustainable with its depressed economy, losing ground in the international community and the sanctions imposed on the country. Therefore it wants to show its good intentions to the international community." Ankara and Moscow are firm in their positions. They both want one another to acknowledge the accusations directed at each other. While Ankara says the Russian jet it shot down strayed into its airspace, Russia vehemently denies it. In the fallout after Turkey shot down the Russian jet, Moscow announced several wide-ranging sanctions on Turkey starting in January, including the end of visa-free travel and a ban on Turkish food products. Russia also called for its nationals to boycott Turkey as a tourist destination. Turkey and Russia have for years differed on policy toward Syria and Ukraine. Ankara has not recognized Russia's 2014 annexation of the Ukraine's Crimea, and has repeatedly accused Moscow of supporting the regime of Bashar Assad in Syria. Apart from his affirmative messages about the normalization process between Turkey and Russia, Putin also expressed support for the recent Turkish-Israeli law. "The fewer problems between governments, the better," Putin said last week after meeting with Israeli Prime Minister Benjamin Netanyahu, according to the TASS state news agency, adding that he views reconciliation between Turkey and Israel "exclusively positive." Turkey and Israel have been holding talks to mend ties, which deteriorated sharply over the situation in the Gaza Strip. Israeli media outlets have said the meeting between Putin and Netanyahu was important for moving the talks forward. Turkey was angered by Israel's offensive on the Gaza Strip in early 2009. The next year, nine Turkish citizens and one Turkish-American died when Israeli commandos raided the Mavi Marmara aid flotilla trying to break the Gaza blockade, sending relations into a tailspin. In 2013, Netanyahu expressed regret over the loss of life.